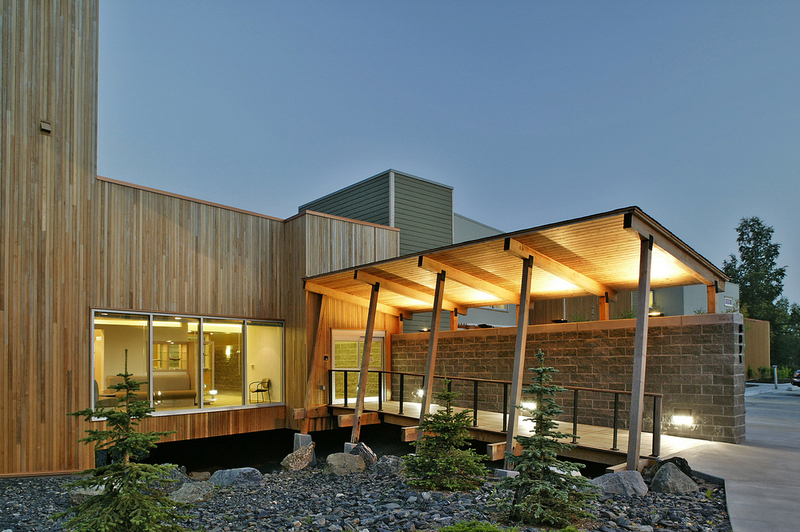 This housing project, located adjacent to the Chugach Mountains, is a development for low income elderly residents. Located on a sloped location, the site design maximizes use of limited flat areas and incorporates the large required parking area to the facility’s advantage with intermingling landscaping and heated, accessible walkways. Inspired by the traditional Native hillside villages, the common areas of the building are built on stilts above the sloped site. The common living and kitchen areas bring the residents together for group gatherings and celebrations and encourage a communal environment. Materials and colors were selected from a palette of nature’s seasons, familiar to its residents from village and rural Alaskan communities. Vistas are framed, and the focus of the building is on the natural landscape on which people thrived, a reminder of where they come from.